How long are eggs good for and should I keep them in the fridge or on the worktop? 1) How fresh are your eggs? The fresh farm eggs that we sell at Sacrewell (and the eggs from my pet chickens at home) are collected every day, so I know exactly how fresh they are on the day that I use them. However, if you purchase your eggs from a supermarket they may already have spent a week being transported and stored before they hit the shelves. As a rough estimate, eggs are good to eat for at least a month after they have been laid, so if they’re already a week old before they get to your kitchen then that reduces the time you should keep them for. 2) Have your eggs been washed? Eggshell is a fantastic natural packaging that protects the egg inside. As a hen lays her egg, it is coated in a thin, anti-bacterial layer called a bloom. This makes the eggshell less porous and helps it to last longer. If you wash eggs that have come fresh from the chickens, this coating will be removed which means your eggs won’t last as long. I only ever wash the eggs from my pet chickens just before I crack them to use them so that they taste as fresh as possible. On the other hand, if you buy your eggs from a supermarket they will have been washed thoroughly, then coated with a new, synthetic coating to replace the natural bloom that has been washed off. This synthetic coating should also help them to stay fresh. 3) How have your eggs been stored previously? As I’ve already mentioned, the eggs we sell at Sacrewell are good to eat for at least a month after they’ve been laid. This applies to eggs that are kept out on the worktop, which is how I keep the eggs from my pet chickens at home. It seems to be a bit of a personal choice whether you keep your eggs on the worktop or in the fridge. 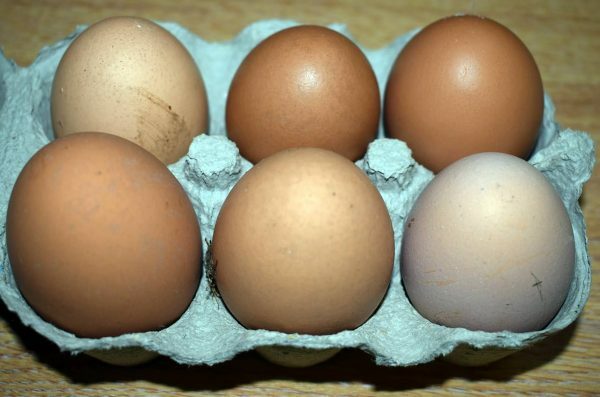 The cooler temperatures will slow down the processes that gradually cause your egg to deteriorate, but if you’re likely to eat your eggs in less than a month it’s fine to keep them outside. The only exception to this rule is if the eggs have previously been refrigerated. Moving to a warmer temperature will cause the pores in the eggshell to open, allowing the egg to deteriorate at a faster rate, so if you’re eggs have previously been cooled in a fridge, it’s important to keep them cool. If you’re unsure about how fresh your eggs are, there’s also a simple test to do at home. Simply pop your egg in a glass of water and see how it floats. The freshest eggs will sink to the bottom and lie flat, those which are a little bit older will rest on the bottom, with one end rising up at an angle, whilst those which are probably too old to use will float. This is because the amount of gas inside the eggshell increases as the egg gets older. Of course, how long an egg is ‘good’ for also depends on what you want to do with it… an egg that’s too old for poaching might still be perfect for scrambling or baking. The best advice we can give is that once you’ve got your eggs, get cracking! Our sandpit and Trec area are officially open! What’s the most unusual food that an animal at the farm eats? Can my daughter help look after the animals? How much milk does a cow produce each day on average?